On an agricultural level, Kentucky prides itself on producing some of the country’s best tobacco, horses, whiskey, corn, soyabeans, wheat, fruits, dairy products, and cattle. However, with regards to past month illicit drug (besides marijuana) use and drug abuse, prescription pain relievers, and tobacco and cigarette use, Kentucky ranks among the 10 States with the highest rates. Notably, for individuals age 12 to 17, Kentucky has ranked among the 10 states with the lowest rates of the perception of risk associated with using marijuana once a month. Kentucky’s rates of past year alcohol dependence or abuse have been at or below the national rates, especially for individuals age 18 to 25 and 26 and older. This consequently ranks Kentucky among the lowest in the country for alcohol dependence or abuse, reducing the amount of residents requiring alcohol treatment. Conversely, Kentucky’s rates for illicit drug use have been mostly at or above the national rate. 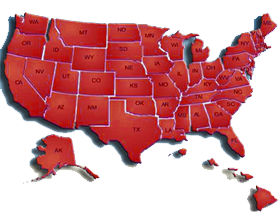 In a 2006 survey, the National Survey of Substance Abuse Treatment Services (NSSATS) states that amount of treatment facilities in Kentucky have generally been stable. Of the 312 available treatment facilities, 185 were private nonprofit, and 118 were private for-profit. Most treatment facilities offer a variety of treatment services with the most common being outpatient care. In Kentucky, 270 facilities offered outpatient treatment, 53 offered residential care, and 12 offered opioid as heroin treatment and other opiate addictions. There were 93 physicians and 23 treatment curriculums authorized to offer bupenorphine as treatment for opiate addiction. The 2006 NSSATS survey also shows a treatment admission total of 19,510 patients; 17,995 were receiving outpatient treatment, which allows the individual to undergo treatment outside the facility, but also requires him to check in regularly with the facility. Since 1997, there has been a consistent decrease in the amount of treatment admissions with no primary substance and an increase in those with one or more reported substances. 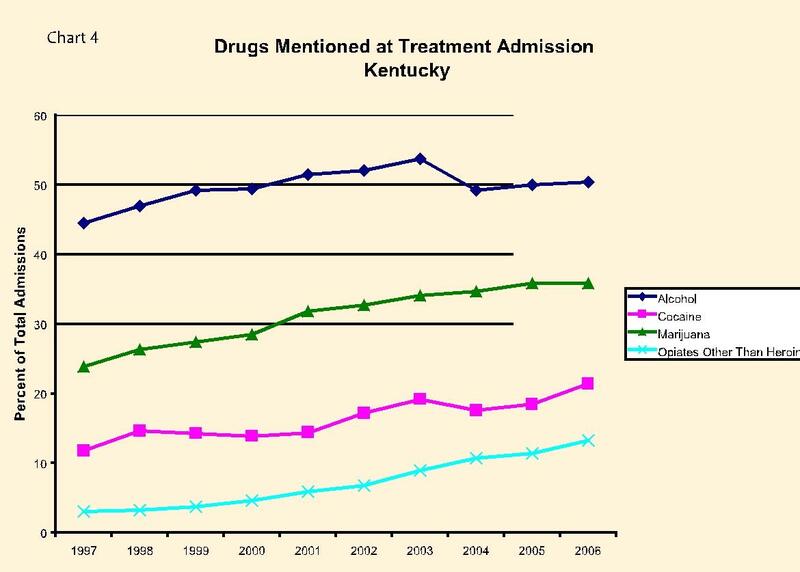 The chart below depicts the percentage of Kentucky’s drug treatment admissions. The last 10 years has shown a consistent increase in the amount of treatment admissions for alcohol, marijuana, opiates other than heroin, and cocaine addiction in Kentucky. Although drug-only admissions have tripled since 1997, admissions for alcohol-only treatment have been stable. The rates for individuals age 12 years and older who needed treatment for alcohol dependency but did not receive prior year treatment have steadily been among the lowest in the country. Similarly, the rates for individuals needing drug-only treatment but have not received prior year treatment have also been at or below the national level. Although it is comforting to see that many of these individuals who needed help took the initiative to seek it, the drug addiction treatment admission rate in Kentucky is alarming. Getting help and refraining from using drugs is the only cure for lowering this rate to where it should be (zero).